The last 70 years have been transformational for the Indian biotech industry, mirroring the nation’s own rapidly advancing economy and rising global status. We have successfully leveraged recombinant DNA technology to deliver biopharmaceuticals, vaccines, genetically engineered crops and enzymes. In doing so, we have created a notable bio-economy valued at $35 billion. We have embraced cutting-edge technologies, built global scale manufacturing capacities, and benchmarked our systems and strategies to global best practices. Currently, India is among the top 12 biotechnology destinations in the world and ranks third in the Asia-Pacific region. 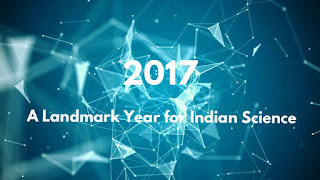 While our immediate goal is to build a $100 billion bio-economy in India by 2025, in the next 30 years, India aspires to become a biotechnology hot spot reputed for its high-value, low-cost innovations in bio-therapeutics including personalised and precision medicine, advanced enzyme technologies, GM crops and bioinformatics. The success of India’s biotechnology industry can be traced to the pioneering spirit of entrepreneurs who leveraged a nascent technology and India’s cost-effective scientific talent pool to bring affordable innovations to the market. Its evolution over the decades mirrored the country’s growing confidence in life sciences. While the 1980s were the decade of enzymes, the next decade saw vaccines gaining prominence as a business segment. The emergence of genomics research companies in the 2000s was followed by Novel biologics and biosimilars making an impact from 2010 onwards. 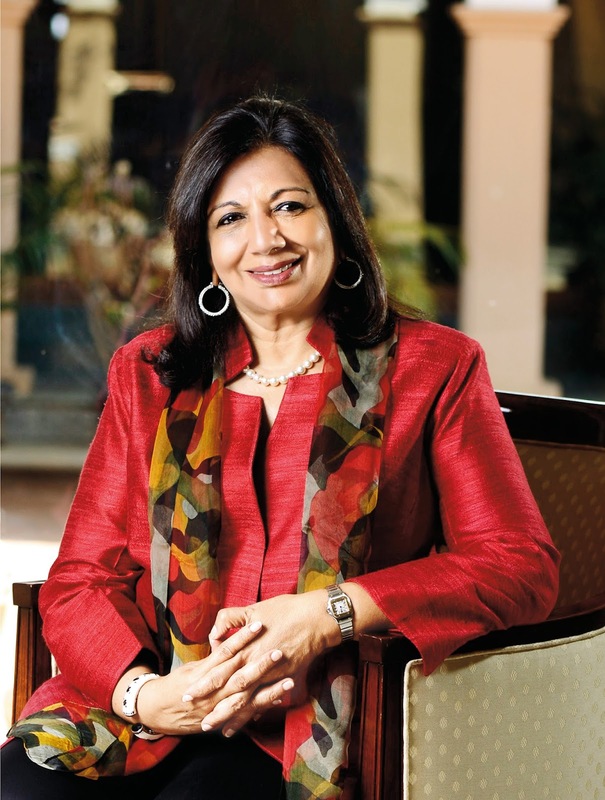 I started Biocon as India’s first biotech enterprise in 1978 in a garage in Bengaluru to manufacture industrial enzymes for food and textile industries around the world. The initial years were tough as I encountered market scepticism, funding challenges, infrastructural hurdles, manpower issues and government apathy. I persevered because I believed biotechnology was the technology of the future with the potential to deliver transformational change. By the mid-1980s, Biocon had evolved as the largest enzymes company of India pursuing an R&D-led biotech business. As few more biotechnology-based companies started coming up, it caught the attention of the government and, in 1986, the Department of Biotechnology (DBT) was established. I was privileged to be invited to be a part of the DBT’s Task Force, which helped articulate the regulatory framework for the industry. Recombinant technologies were at the fulcrum of regulations covering vaccines, genetically modified crops and biopharmaceuticals. Biocon’s stock market debut in 2004, as the first biotech company in India to go public, commanded a premium valuation. It led to the development of a biocluster in Bengaluru, attracting a number of large and small biotech companies. These included Strand Genomics, a bioinformatics company; Gangagen, a phage-based antibiotic company; Reametrix, a whole blood-based diagnostics instrumentation company; Syngene, which spearheaded research services; and Bio-IT companies like Genotypic Technology, BigTec and Molecular Connections. The cluster also spurred the growth of ancillary biotech companies. 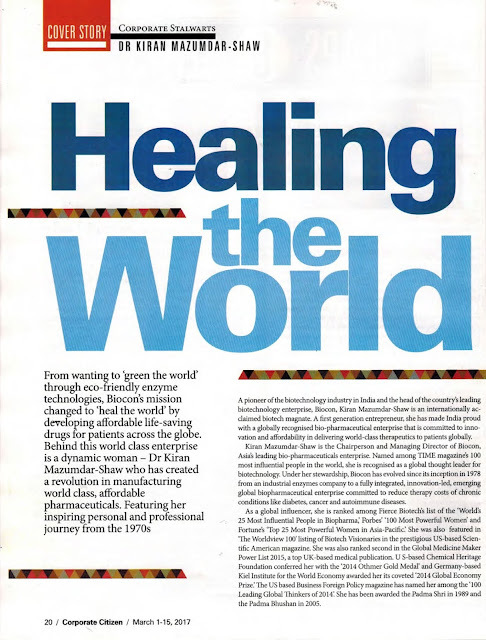 The disruptive power of Indian biotechnology innovation grabbed the attention of the world in the late 1990s when companies like Shantha Biotechnics, Bharat Biotech, and Serum Institute started producing and supplying vaccines at a fraction of the cost of western drug makers. Today, ‘1 in 3’ children globally are immunised with a ‘Made in India’ vaccine. Having built a strong base of indigenous R&D capabilities and excellent clinical trials and manufacturing infrastructure, the industry started developing biotech-based drugs or biologics. 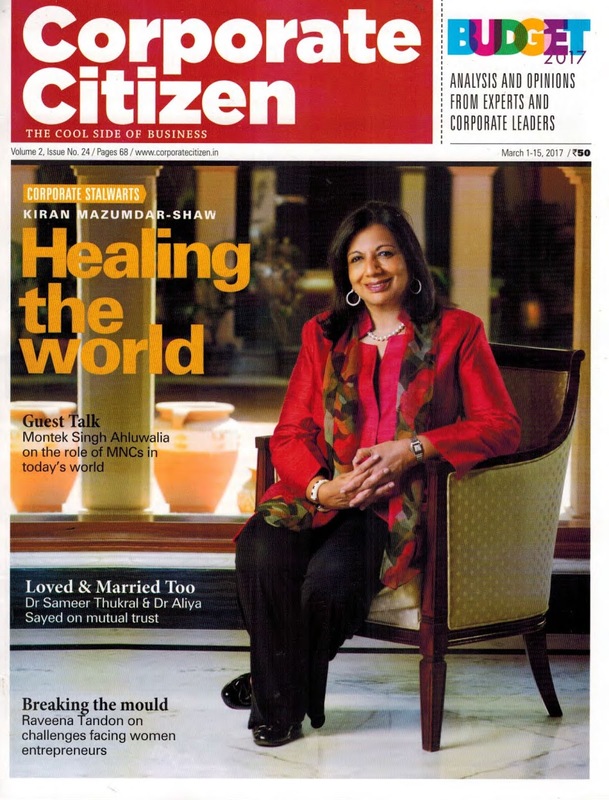 Taking the lead, Biocon introduced India’s indigenously developed recombinant human insulin using a proprietary fermentation technology in 2004 and, along with Wockhardt, was able to break the monopoly of innovators in insulins by offering indigenously manufactured affordable alternatives, thus enhancing access to this life-saving therapy. Over the years, Biocon has successfully launched two novel biologics and five biosimilar products aimed at cancer, diabetes and autoimmune diseases, making these advanced therapies available to a large patient population. Today, there are a select few companies such as Dr. Reddy’s Labs, Zydus Cadila, Intas Pharma, Reliance Life Sciences, Lupin, etc., which are active in the area of complex biologics/biosimilars. The biotechnology sector is evolving fast and it promises to transform healthcare, agriculture and environmental management, leading to the dawn of the ‘Biotechnology Age’. By 2030, the Indian bio-economy sector is expected to attain a size of $200 billion. I foresee the intelligent use of data to transform global health. India’s highly developed software skills offer a unique Bio-IT opportunity to mine, analyse and interpret data and create algorithms that can match therapies with the diagnosis. There is also considerable excitement over the promise of targeted genome editing technologies like CRISPR CAS9, which can potentially prevent several diseases, including some cancers, and prevent specific genetic anomalies from being passed on to future generations. I believe, by 2050, cancer will become manageable through advances in the field of immuno-oncology, which works by stimulating an immune response against malignant tumours, thus replacing the need for chemotherapy and radiotherapy. Biotechnology in agriculture and farming has the potential to address numerous challenges associated with food security in India. Just as the commercial cultivation of genetically modified cotton in India, starting 2002, helped convert the country from a net importer to a net exporter of cotton, selective propagation of genes that improve yields and are resistant to pests, flooding and drought, could make food cheaper, more nutritious and abundant. Bioremediation techniques, which offer a cheaper alternative to conventional cleaning technologies, can be used to address the impending global crisis in the area of water and energy. Application of technologies like the ones being developed by Sea6 Energy, will help harness the potential of the oceans to provide solutions in energy, agriculture and feed, thus helping restore the ecological balance. This article originally appeared in September 2, 2017 issue of Business World Magazine. That India’s maiden satellite was named after the legendary astronomer and mathematician, Aryabhata, is only befitting. In the 5th Century B.C., Aryabhata successfully calculated the diameter of the earth and the moon, proposed that the earth rotated on its axis and determined the value of Pi up to the fourth decimal place, among other things. It is this deep knowledge of advanced maths and science that made India the global knowledge hub of the ancient world, drawing scholars from distant lands to its universities at Nalanda and Taksashila. Centuries later, in 1947, while delivering his historic “tryst with destiny” speech our first Prime Minister Pandit Jawaharlal Nehru referred to the need of leveraging India’s historic connect with science and technology for the task of nation building. ISRO’s soaring achievements may have taken the world by surprise and what’s more, they have demonstrated India’s potential to drive ‘affordable innovation’ that can deliver high value with frugal resources. Thanks to ISRO, what India has achieved in space technology is not only world class, it is world beating! India has been able to scale the heights of success driven by a scientific team on a “mission mode” led by inspirational leaders like Dr. Vikram Sarabhai, Prof. Satish Dhawan, Prof. U.R. Rao, Dr. K. Kasturirangan, Shri G. Madhavan Nair, Dr. K. Radhakrishnan, Shri A.S. Kiran Kumar and Dr M Annadurai! The legendary Dr APJ Abdul Kalam had also contributed to the scientific excellence of this great institution. He drove India's first indigenous Satellite Launch Vehicle program (SLV-III) and the Polar Satellite Launch Vehicle (PSLV) project during his two-decade association with ISRO. Today ISRO is proof of what inspirational leadership can achieve with frugal resources! Just two months ago, ISRO helped India script history by successfully launching a record 104 satellites into orbit using a single rocket, beating the previous record of 37 satellites deployed by Russia in 2014. Forty-two years ago when ISRO launched Aryabhata it had to start from scratch as India lacked the kind of sophisticated infrastructure that Western nations had. Aryabhata was built in a period of 30 months by a young team of scientists and engineers at a project cost of a little more than Rs 3 crore. In the succeeding four decades, ISRO has stuck to its philosophy of ‘affordable innovation’. India’s Mars Orbiter Mission was without doubt the cheapest inter-planetary mission ever to be undertaken since Martian exploration began. ISRO designed, built and launched the Mangalyaan space probe for US$74 million, which is nearly a tenth of NASA’s Mars probe Maven! It was even cheaper than the US$100-million spent in producing the Hollywood space drama Gravity! As our Honourable Prime Minister Shri Narendra Modi had pointed out, the 650 million km journey to Mars cost India a mere Rs 7 per kilometre, less that a Rs 10 per km auto ride in Ahmedabad! The frugality of its Mars orbiter notwithstanding, India stunned the world when it became the first nation ever to have succeeded in reaching the Red Planet in its maiden attempt! This was indeed a phenomenal milestone which saw every Indian bursting with pride. Navigation with Indian Constellation, or NAVIC, the program that put India among the elite group of nations to have their own satellite navigation systems, was also a feat of cost-effective space engineering! At US$350 million, India spent less money on their entire satellite navigation network than the cost overrun of Galileo, the European satellite navigation network project! Even ISRO's 2008 Moon Mission, Chandrayaan I, at a cost of ~US$100 million, was a feat in itself considering no other country had succeeded in executing a lunar mission for less than US$500 million. More importantly, ISRO’s affordable innovation succeeded in collecting data that confirmed the presence of water on the moon! By championing the ‘Innovate in India’ mantra, ISRO has boosted our self-belief as a nation. For too long, we have been prisoners of a colonial mindset with low levels of confidence in our own capabilities which has led us to look at the West for scientific validation. Through its pursuit of excellence, ISRO has created a powerful and formidable brand for India, which is about leadership in science & technology and innovation excellence! ISRO’s emergence as a frontrunner in the growing private space market has led countries like US, UK, Germany, Canada, Japan, Switzerland, France, Denmark, Israel, the Netherlands, Belgium, Italy and several others to seek India’s help for satellite launch services. It’s interesting to note that of the 180 foreign satellites launched by ISRO since 1999, more than half belonged to the US! ISRO is today a byword for world-beating scientific excellence! It has helped India stake a claim as an exclusive member of the global space club. We are now ranked among the world’s top 6 space faring nations in terms of technological capabilities! I remember that In the 1960s and 1970s every single scientist who wanted to pursue space research aspired to go to NASA. Only a few remained in India and not by choice I may add. This exodus of Indian scientists is reflected in the large representation of people of Indian origin at NASA! However, it is an entirely different picture today. The first choice for many of the current generation of Indian space researchers is ISRO! And I wouldn’t be surprised if we witness the return of a large number of the Indian diaspora at NASA so that they can be part of this great space mission that our nation has embarked on! As India’s space program gains momentum and stature, ISRO plans to increasingly outsource space science services to the private sector and ensure that its own scientists and engineers focus on space exploration and research. While ISRO has a nearly 30-year-old partnership with the Indian industry, the private sector's contribution has largely been restricted to fabrication, testing and assembling. Under the banner of ‘Make in India’, ISRO is now entrusting Indian companies with the task of building rockets and satellites! The push for greater private sector participation is also in sync with the larger efforts of ISRO to augment capabilities and tap the growing commercial market for space-based surveillance, remote sensing and telecommunication. By collaborating with India Inc., ISRO can create a robust space industry which can carve out a bigger slice of the estimated US$300 billion-plus global civilian space market, leveraging India’s innovative, vibrant and tech savvy entrepreneurial ecosystem. If Richard Branson’s Virgin Galactic and Elon Musk’s Space-X are dreaming big in terms of space tourism, so can Indian entrepreneurs. Today ISRO is helping India address several socio-economic and developmental needs of the country using space technology. ISRO has already taken the benefits of the space technology to the remotest of Indian villages to address the basic needs in education, health, nutrition, and drinking and irrigation water. Going forward, ISRO’s satellites can play a big role in realizing India’s aspiration of transforming itself into a country empowered by digital technologies. It took 20 years for India to have the first 100 million Internet users, but the next 100 million users will come in less than three years. To cater to rising demand, it is imperative to look beyond the traditional modes of internet delivery to space-based solutions. Satellite internet can provide an economical solution to most of the challenges faced by ground infrastructure like optical fibres. In fact, satellite-based Internet systems can prove more effective at distributing Internet broadband capacity over a large area as well as reduce congestion in already overloaded networks, thus improving the quality of service provided by mobile networks. Space-based technologies can be integrated into 5G systems to help take advanced Internet of Things (IoT) applications to regions that are beyond the reach of terrestrial networks. Going forward, ISRO plans planetary exploration missions, a reusable launch vehicle, and a program to send astronauts into space in the coming years. Space science is going to be a new industrial sector for India. This can be a differentiated ‘Make in India’ story with high scientific skills and technological capabilities. This will open up huge demand for scientific and engineering skills, creating new jobs. India's pursuit of cutting-edge space technologies, which had started off as a national mission is now becoming a large national enterprise, with the potential to spur sustainable and inclusive economic growth. When I reflect on my own entrepreneurial journey, I find lot of parallels between ISRO’s march to the forefront of global space exploration and Biocon’s ambition to become one of the most recognized Indian names in the global biotechnology sector. I am very proud that our company is today considered to be among the world-beating innovators in biopharmaceuticals. As a pioneering biopharma enterprise, Biocon has been among the first in India to invest in developing recombinant DNA and bio-processing technologies that can deliver innovative and affordable biologics. We have focused relentlessly on chronic disease spaces like diabetes, cancer and autoimmune conditions, marked by unmet needs. Our mission is to develop drugs that can be labelled “blockbusters” not because they can earn a billion dollars but because they are affordable enough to benefit a billion patients! Just as ISRO has made transformational impact through space technology, my company, Biocon, has harnessed the potential of Biotechnology to make a huge difference through affordable insulins, and cancer drugs for the benefit of patients the world over. ISRO’s triumphs in space science have fired up the best and the brightest minds in India to contribute to this emerging narrative of technical and scientific excellence. This is evident from an innovative start-up venture, Team Indus which is attempting to create space history by becoming the first private enterprise in the world to not only build and land a spacecraft on the moon but have a rover ride the surface. What is equally interesting is how India is approaching the unfolding ‘Moon Race’ by following a dual strategy of a state-funded program in the form of Chandrayaan 2 and a privately-funded moonshot via Team Indus. It is an exciting model of private-public partnership that augurs well for ushering in a whole new and exciting era for space exploration. Team Indus is scheduled to launch its lunar probe this December on board ISRO’s extended Polar Satellite Launch Vehicle to the moon. It has benefited immensely from its collaboration with ISRO’s scientists who had worked on Chandrayaan 1. Interestingly, ISRO is also planning to launch Chandrayaan 2 early next year, which includes a large rover to carry out several significant scientific experiments on the moon. Team Indus is the only Indian team competing for the Google Lunar XPRIZE, which is a global competition to challenge and inspire engineers and entrepreneurs to develop low-cost methods of robotic space exploration. I firmly believe that a win for Team Indus will be a win for India as this pioneering entrepreneurial effort in space research can inspire scores of others and be the cornerstone of success for India on the world stage. When India was celebrating the success of its first Mars mission, I was very excited to see the smiling faces of the women scientists of ISRO being splashed all over the media. It was a watershed moment as far as the Indian Space Program is concerned. But, more importantly, it shattered stereotypes about space research and Indian women. 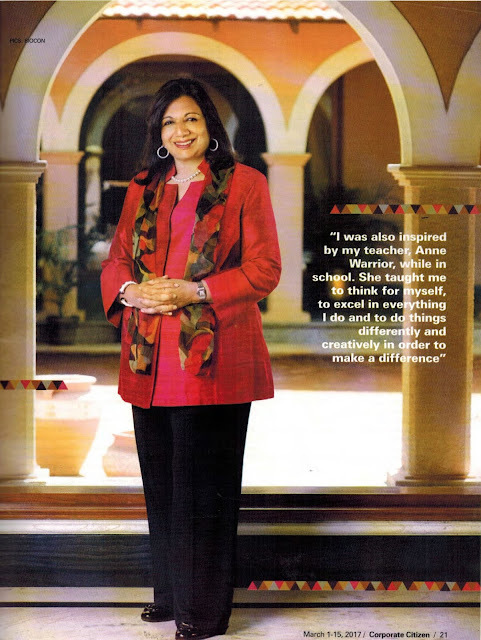 I, myself, had to break many a gender barrier when I started Biocon in 1978 as a young, 25-year-old woman entrepreneur, with no business background and limited financial resources. This kind of gender bias was not specific to India. 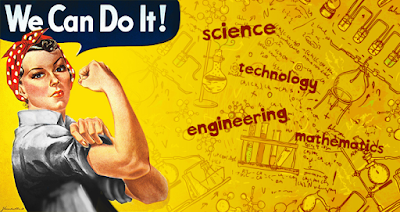 Even in Western society, women scientists were pushed to the background despite playing a crucial role in science. In is noteworthy that in the late 19th century, a group of women, known as ‘Harvard Computers’, helped process astronomical data for Harvard Observatory Director Edward Charles Pickering. In the 1960s, a team of African-American women mathematicians in NASA played a vital role in the US space program. Their stories would have remained untold had it not been for the book and the subsequent Hollywood film 'Hidden Figures' that are based on their extraordinary contributions. Thankfully, that landscape is changing now as more and more women prove their mettle as engineers, mathematicians, and computer programmers. Scientific organizations are realizing the diversity of thought, creativity and innovation that women bring to the table and this is opening up more opportunities for women scientists. That is why today we are seeing a large representation of women in the innovation ecosystem of India. One-third of the 3,000 entrepreneurial start-ups in the life sciences sector have been founded by women! Over 20% of ISRO's over 16,000 employees are women. In my company, Biocon, over 30% of the 4,000 scientists are women. I believe, women are an integral part of the scientific community and at ISRO they have played key roles in the numerous successful missions of the agency. It gives me immense pleasure to see many women ISRO scientists to have become household names, today. While Indian-origin space pioneers like Kalpana Chawla and Suneeta Williams have been an inspiration, many girls today are aspiring to follow in the footsteps of an Anuradha TK, a Nandini Harinath, a Valarmathi or a Tessy Thomas! Now that ISRO has built credibility through world-beating scientific excellence the path ahead towards global leadership is going to be extremely exciting. ISRO has proven beyond doubt that it is not about the amount of money you invest but it is about the scientific conviction and passion that you display which can help you reach for the stars! ISRO, is truly a shining example of ‘mind over matter’ that reflects that if you have the mental acumen of our scientists and engineers, then money doesn’t matter. ISRO today invokes a sense of national pride for every Indian citizen. It’s an inspirational story of how self-belief and conviction can lead a nation to set new benchmarks in scientific excellence. By championing cutting-edge space exploration and partnering with innovation-led start-ups in the private sector ISRO can create a starburst of advanced innovation for our country and our future! 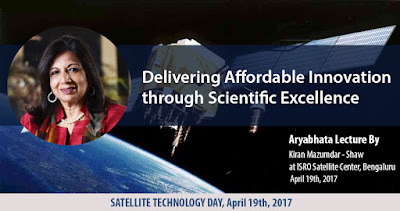 This 'Aryabhata Lecture' was delivered by Kiran Mazumdar - Shaw at ISRO Satellite Centre, Bengaluru on April 19th on the occasion of Satellite Technology Day. The new fiscal year promises exciting opportunities for the Indian economy, which is scheduled to bring in a game-changing new reform in the form of the Goods & Services Tax. Expectations of wider economic reforms, new measures to improve the ease of doing business in India and higher infrastructure investments also augur well for the prospects of economic growth of India, which is the fastest growing major economy in the world today. Signals emanating from the global economy are also positive. According to economists, 2017 is witnessing synchronous recovery in global growth for the first time since the recession in 2010. Emerging economies remain the main driver of the strengthening global outlook, as they continue to contribute more than three-quarters of total global GDP growth in 2017, according to the International Monetary Fund. As conditions look favourable for the economy growing at a faster clip, it is time for India to revisit its aspirations of double-digit GDP growth. If we are really serious about achieving this growth pace, we need to focus on the mission of Digital India and leverage the transformative power of a technology-driven economy. We all know that India suffers from a huge infrastructure deficit. It is estimated that India’s infrastructure could require an investment of up to US$1.7 trillion by the end of the decade, as per the World Bank report. Investing heavily on infrastructure has time and again proved to be one of the most successful recipes for accelerated economic growth. However, we also know it requires huge capital investment and has a long gestation period. Nevertheless, it cannot be ignored for long. To leapfrog India’s traditional deficit in physical infrastructure, we need to urgently invest in building a strong Information & Communication Technology (ICT) backbone, which will present many unique opportunities by enabling businesses in the areas of financial services, education, healthcare, agriculture, retail etc. and will improve economic conditions in remote areas. Above all, digital infrastructure growth can empower the government to embrace and enable innovation, provide resources to help increase agricultural productivity as well as enable universal healthcare access. It can also bring financial services to the unbanked rural and underprivileged communities and help fulfil the country’s longstanding goal of ‘education for all’. India, like the rest of the world, is witnessing a rapid adoption of digital payments. This is being driven by deeper mobile phone penetration, concerted policy action by the Reserve Bank of India and government initiatives like Aadhaar and Jan Dhan Yojana. Demonetisation has also given a decisive push to the adoption of digital payments. 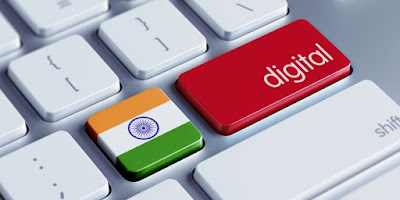 As millions of these Indians adopt digital payment methods they will be able to connect to the formal financial sector as customers and suppliers. A report published by the McKinsey Global Institute (MGI) says increased use of technology in the realm of Financial Services could give 300 million Indians access to banking services by 2025 and raise their incomes by up to 30% thanks to better access to credit and the ability to save and make remittances. The McKinsey report also estimates that remote learning, massive open online courses (MOOCs) and other digital systems could have an economic impact of US$ 60 billion to US$ 90 billion a year by 2025 thanks to higher productivity among a larger number of skilled workers. India could have about 24 million more high-school and college-educated workers and 18 million to 33 million more vocationally trained workers by 2025 as a result of digitization in the education sector. Disruptive technologies could transform the delivery of public health through remote health services and digitally enabled healthcare workers who can link specialists with patients in rural areas. By 2025, some 400 million of India's poor could get access to better healthcare through technologies that bring medical expertise to modestly skilled health workers in remote areas. Technology applications in the area of agriculture, like the use of hybrid and GM crops, precision farming, and mobile Internet–based farm-extension and market-information services could raise the incomes of as many as 100 million farmers and bring better nutrition to 300 million to 400 million consumers by 2025. In the area of energy, smart metering could save US$15-US$20 billion a year by 2025 in reduced transmission losses. Technology can also be used to address India’s infrastructure deficit, with McKinsey estimating these interventions could help India build 10 million more affordable homes by 2025. Digital India has a huge role to play in spurring economic growth. India needs to embrace technology to deliver superior and sustainable solutions for a better life and a brighter future and ignite the entrepreneurial energy of today’s youth. If India can leverage the transformational power of technology through innovation, human ingenuity and, above all, effective leadership, it will be able to achieve sustainable double-digit economic growth. A couple of years ago, India celebrated the success of its first Mars mission and I was very excited to see the smiling faces of the women staff of Indian Space Research Organization (ISRO) being splashed all over the media. It was a watershed moment as far as the Indian Space Program is concerned. But, more importantly, it shattered stereotypes about space research and Indian women. These are boom times for Indian science. In the last few years, science and technology, as a sector, has been receiving a lot of national spending with a lot of new universities and institutes that promotes science education and research coming up in the near future in India. One aspect of scientific development in India that comes across as a pleasant surprise is the active participation and representation of women in the field of science and technology. If former Indian president Dr. A.P.J. Abdul Kalam was known as the ‘Missile Man’ of India, we have Tessy Thomas who is known as the ‘Missile Woman’ of India. She is the first woman scientist to head a missile project in India. Likewise, we have many more encouraging examples where women have broken the glass ceiling and made a mark in their respective fields. Today, 8 of the Top 10 Banks in India are headed by women and 12% of India’s 5,100 pilots are women. However, stepping into the male-dominated domain of Indian science is not easy for a woman researcher. Women in science continue to have an incredibly difficult time being treated fairly because of the unfair system and sexism. And I can say this by drawing examples from my own life experience. The mind-set of the society is that women are less capable of understanding science, although all evidence is to the contrary. I faced seemingly insurmountable road-blocks on my path to building Biocon into the enterprise it is today. Initially, I had credibility challenges where I couldn't get banks to fund me; I couldn't recruit people to work for a woman boss. I can credit my success to my education and upbringing that had helped instil a strong sense of self-belief and a never-say-die spirit in me. In India, women face discrimination when it comes to scientific institutions and science education. A new study by UNESCO outlining the involvement of women in science has some stark figures for India. As per a report by the UNESCO Institute for Statistics (UIS), 44% of bachelor students are female while 41% get till the doctoral level. The report further states that women researchers show a tendency to work in the academic and government sectors while men dominate the private research sector, which offers better salaries and opportunities for advancement. Moreover, as per a latest report by the World Economic Forum, only 14.3% of science researchers in India are women. The proportion is worse than that in several West Asian countries like Bahrain, where women account for 41.3% of researchers in science. India is aggressively working towards establishing itself as a leader in industrialisation and technological development. The Government of India, through the Science, Technology and Innovation (STI) Policy-2013, among other things, aspires to position India among the world’s top five scientific powers. If India has to realise this dream, women have to take a central stage. They need to capitalize on their inherent qualities of compassion, sensitivity, multi-tasking and above all, the inner strength to excel. Coupled with their hard work and perseverance, women can achieve anything they set their minds on.